Which contacts can I send email to? 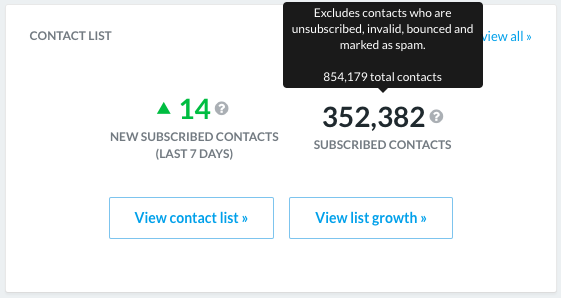 On the dashboard, you will see the total number of Subscribed Contacts you can send email to. They've unsubscribed from your list. In any email that you send to your list, an unsubscribe link is included in the footer. If a user clicks unsubscribe in one of your emails, they'll be unsubscribed from your list going forward, preventing you from emailing them unless they resubscribe. They have an invalid email address: When you import or collect an email address through one of Hive's Capture Apps, those email addresses are validated to make sure they're deliverable. If an email address is old, inaccurate, or invalid for another reason, the contact is marked as invalid within Hive.